*Affiliate links used in this post for your shopping convenience. Read our full disclosure policy here. Here's what we started with. 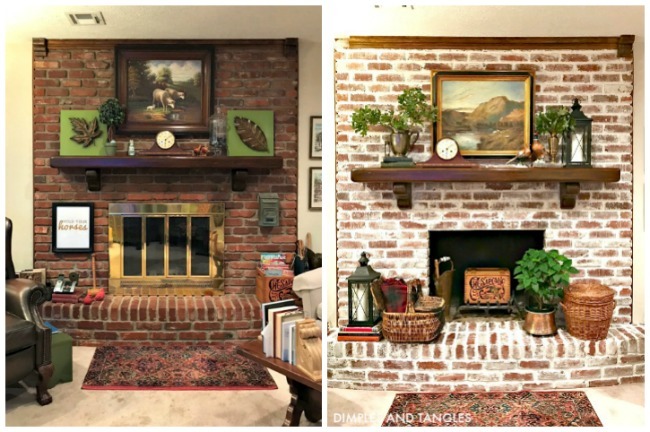 The brick was pretty but after almost 50 years of use there was some staining and my Mom was wanting to lighten it up. To begin, prep the area. 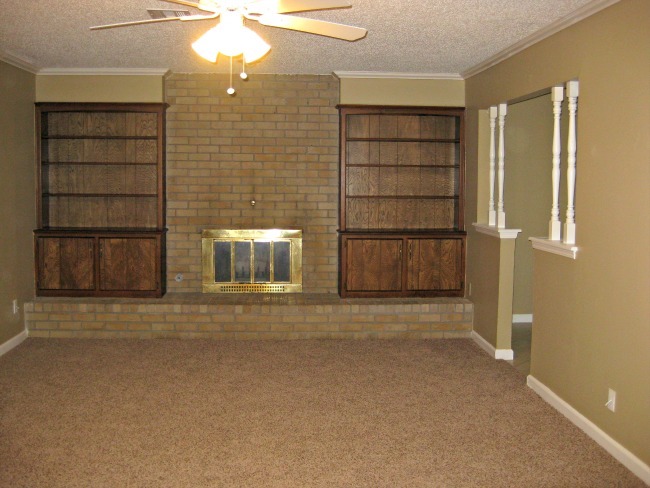 Thoroughly vacuum the entire bricked area to remove any loose dust or soot. 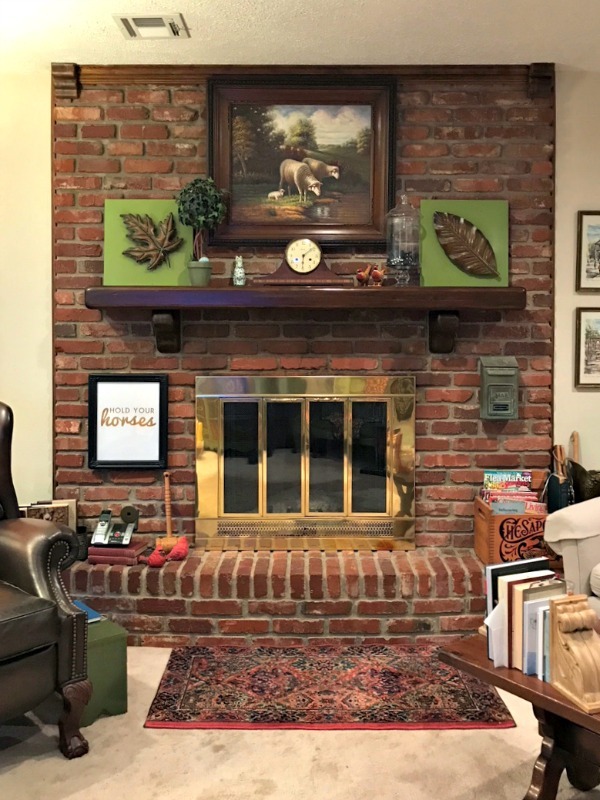 If you have dark marks above the firebox from smoke (you can see a dark area in the photo from years of use) don't worry about it, it will be fine. 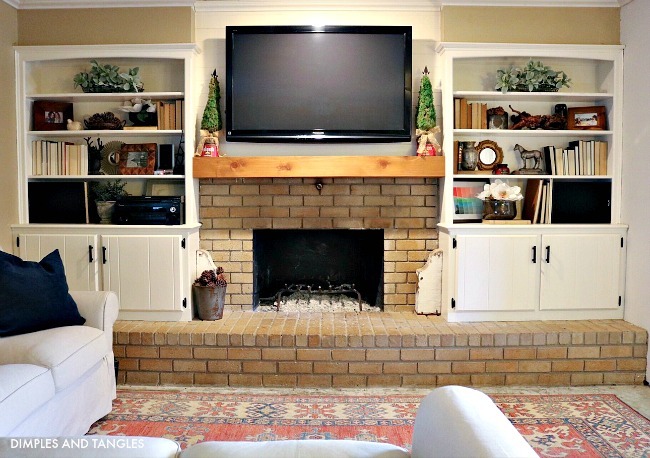 Remove what you can (mantel, fireplace screen, etc.) or tape off around all edges of things you can't remove. 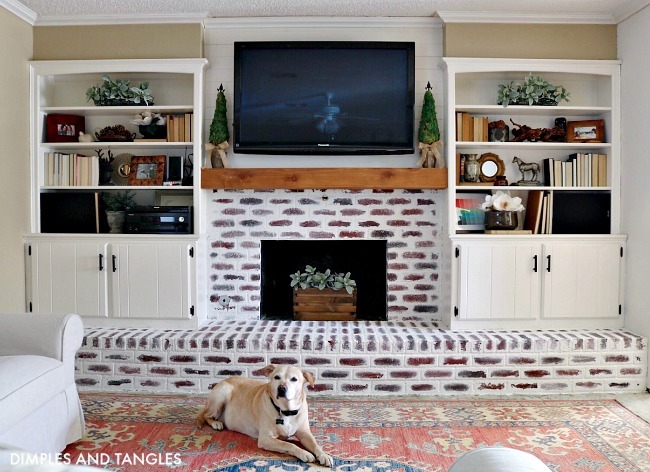 Tape off walls, ceiling, and flooring around all edges of brick. Lay out a drop cloth or cardboard to protect the floor. Gather supplies and mix the mortar. We used this thinset mortar mix. My sister researched this project and found that many people used and recommend this mix- it's actually mortar instead of thinset. The one that we used was easier to find though and worked just fine for our purposes. 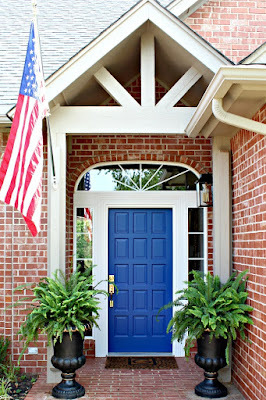 The key is you want WHITE, make sure it's not the regular gray mortar. Generally follow the directions on the bag for mixing and stirring time. You'll want it to be thick, like the consistency of pudding or peanut butter... able to stir but not runny at all. (You'll get an arm workout stirring it!) Another helpful visual might be that if you pick some up with your stir stick and flip it upside down, it should stay there and not drip. If you have a willing partner, it's best to do this job with two people. It's so much easier and faster. I found it easiest to work by putting a smaller amount of mortar in a disposable cup that was easier to hold in one hand while I spread it with the other (rather than constantly dipping out of the big bucket). We worked in smaller sections at a time. 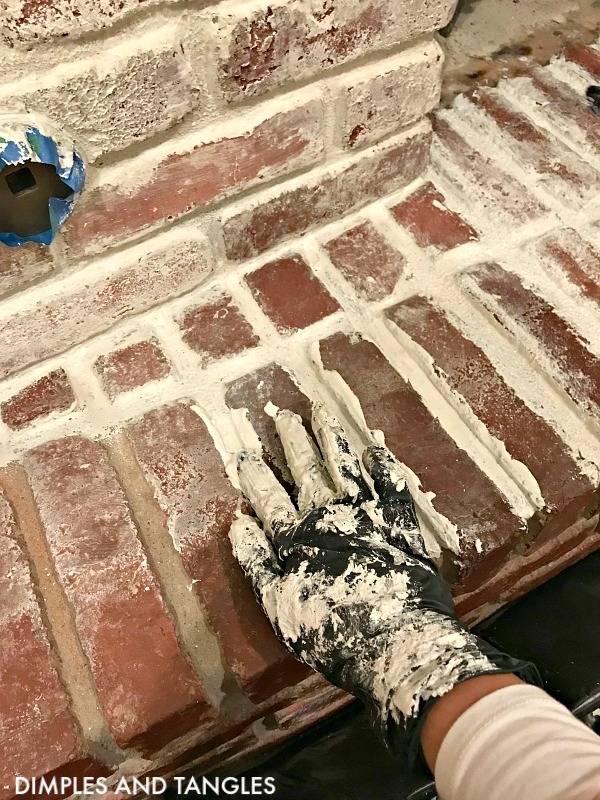 I used my finger to dip mortar from the cup and spread it along a grout line. 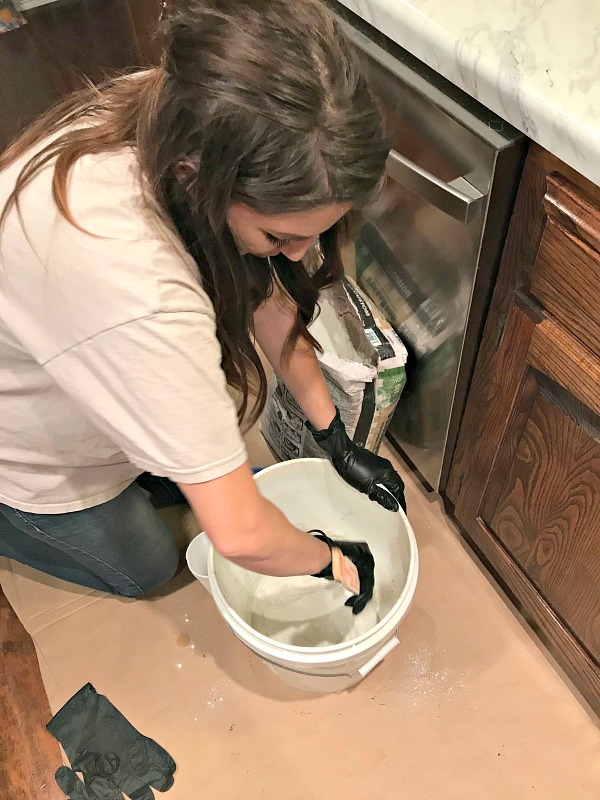 You could also use a putty knife to spread the mortar in the grout lines if you'd like (read more below on that). The grout lines were deep so I filled them in pretty well. 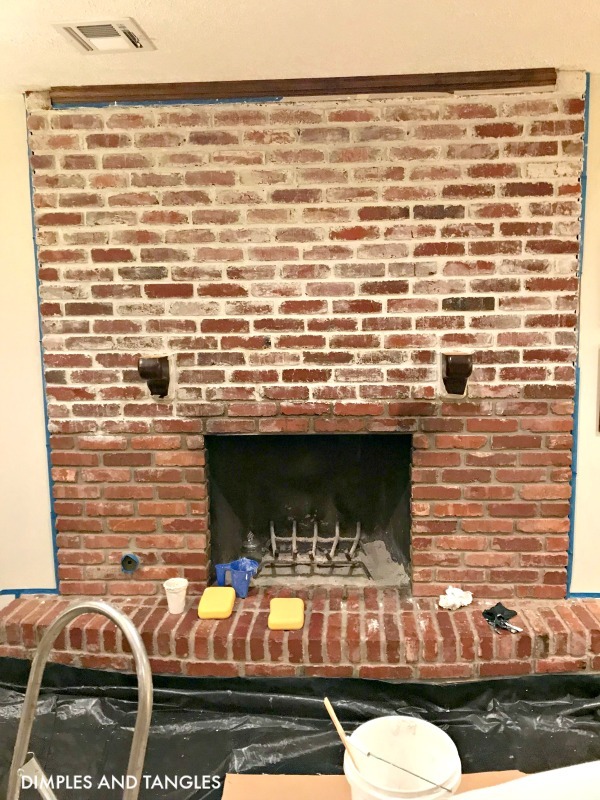 I didn't actually cover the bricks at this point, just filled mortar into the grout lines. Then, after I finished filling in a section, Sarah would come behind me and start working over the area with a damp sponge. 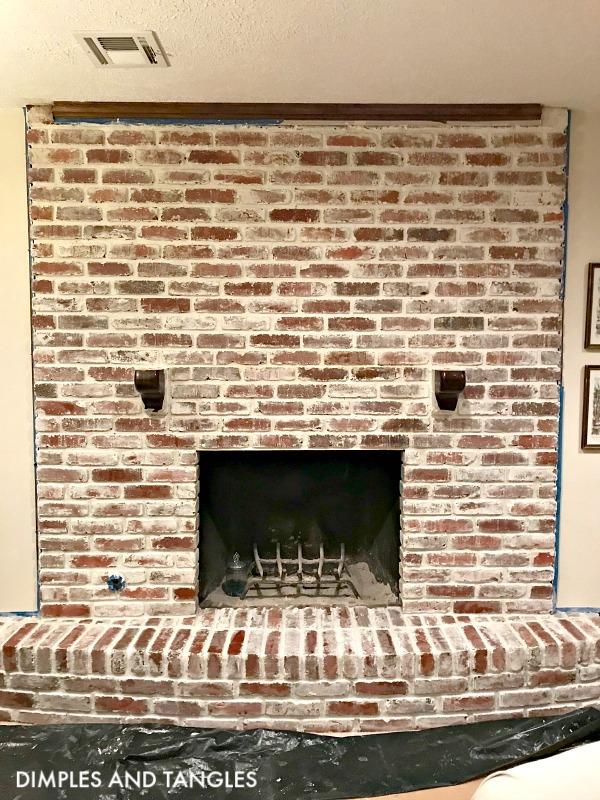 She basically just wiped some of the mortar from the grout lines over the bricks until she was happy with how it looked. The sponge is also to add a bit of texture to the thinset to make it look a little bit more realistic, so do some dabbing up and down too to rough it up a bit. You can decide the coverage you want... if you wipe too much off just add a little more back on and keep working with it. 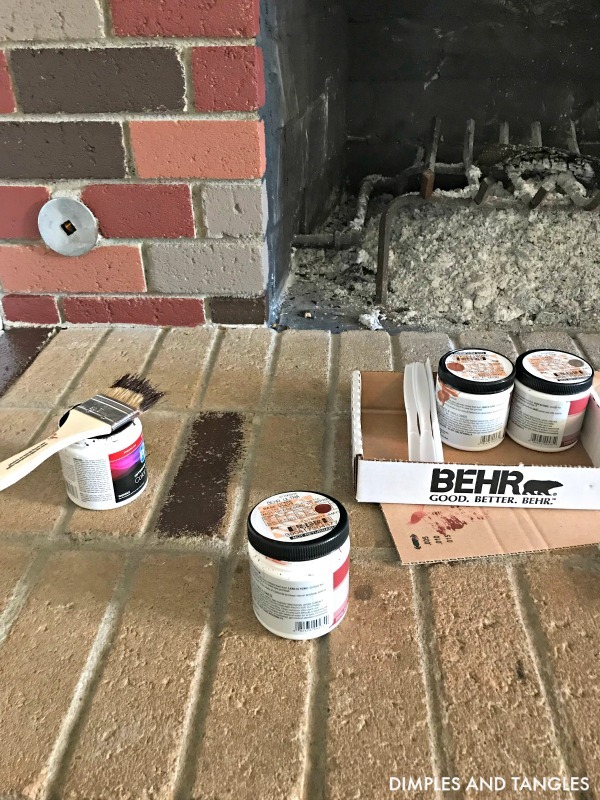 The mortar will get whiter as it dries, so just be aware that it looks a little darker when it's wet. That being said, ANYTHING you spread over the bricks will leave a residue, so just keep in mind that a little goes a long way. We did the initial wipe and then after an area had set for a while Sarah went back again with the damp sponge and wiped a little more until she was happy with the look. That's it! 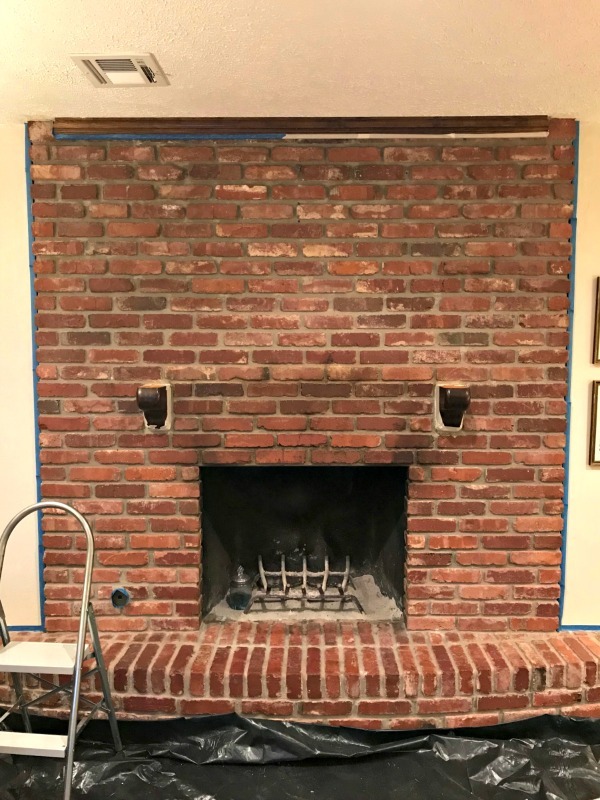 We did the fireplace in one night, it took about 6-7 hours with both us us working. We came back the next night to finish up and Sarah touched up a few spots here and there. 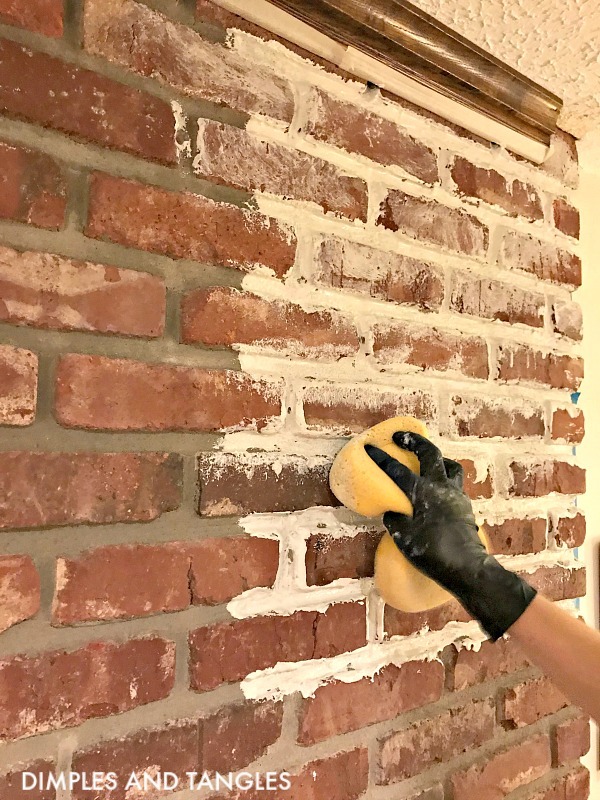 It takes a few days for the mortar to fully set and completely dry, so she was still able to wipe with a damp sponge here and there if she wanted to lighten up an area a little more. There is a bit of a powdery residue while it is drying, but once it is fully set nothing will rub off (no white powder on your pants if you sit on the hearth!). There is no need to seal anything once it is fully dry, it's good to go! 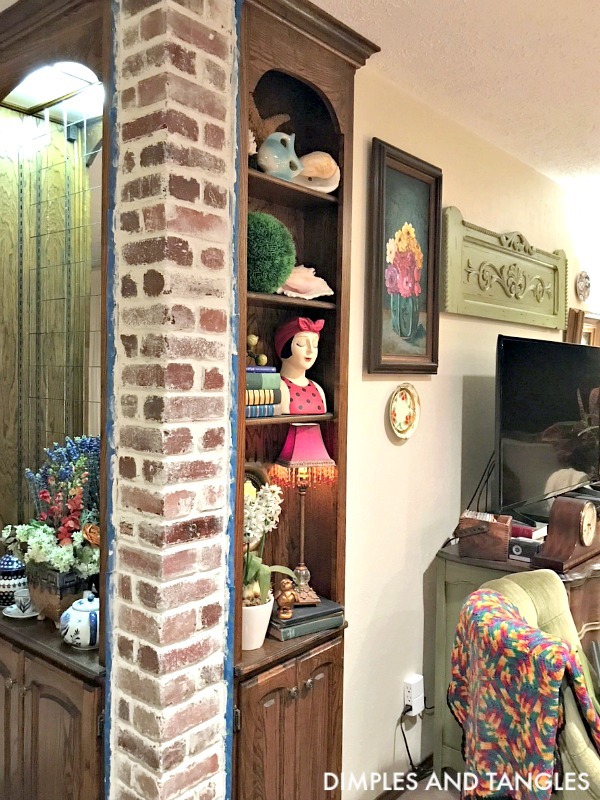 We also did a small brick post on the other side of the room. 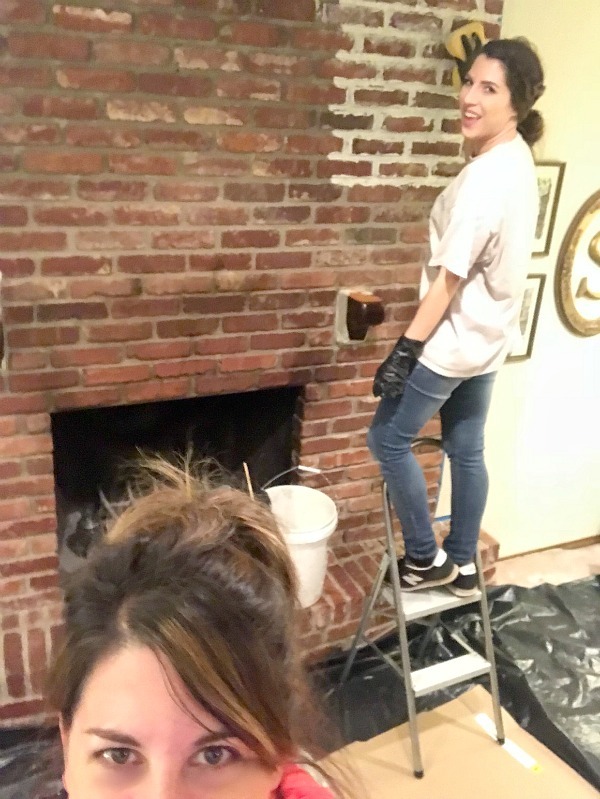 We actually started here and practiced our technique before we tackled the fireplace. After a day or so we decorated it for my parents' return home. It still took a few days before no residue would rub off at all, but it's ready to use pretty quickly after you're finished. 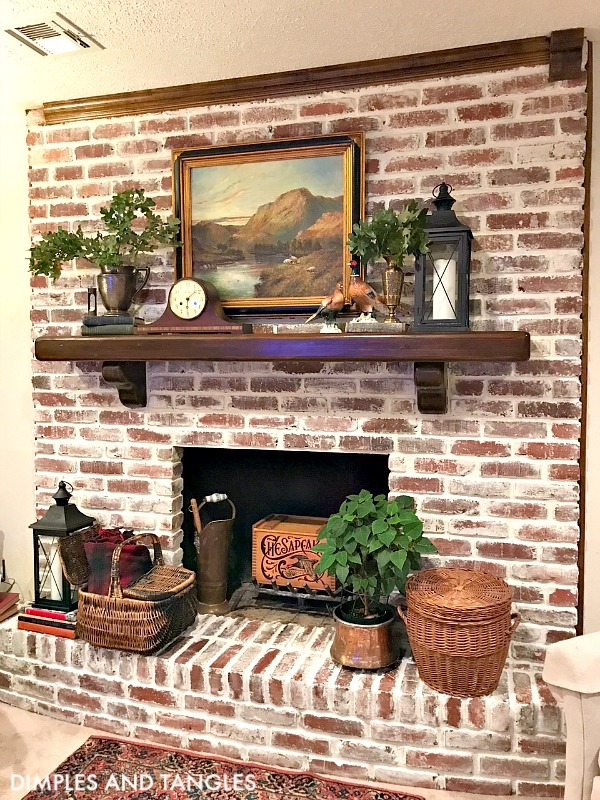 She did not like the color of her tan brick, so she started by painting each brick in a variety of shades of red, brown, and gray (she just used latex sample pots of paint). Then, after a few days she followed the same process to mortar wash her brick, with one small difference. 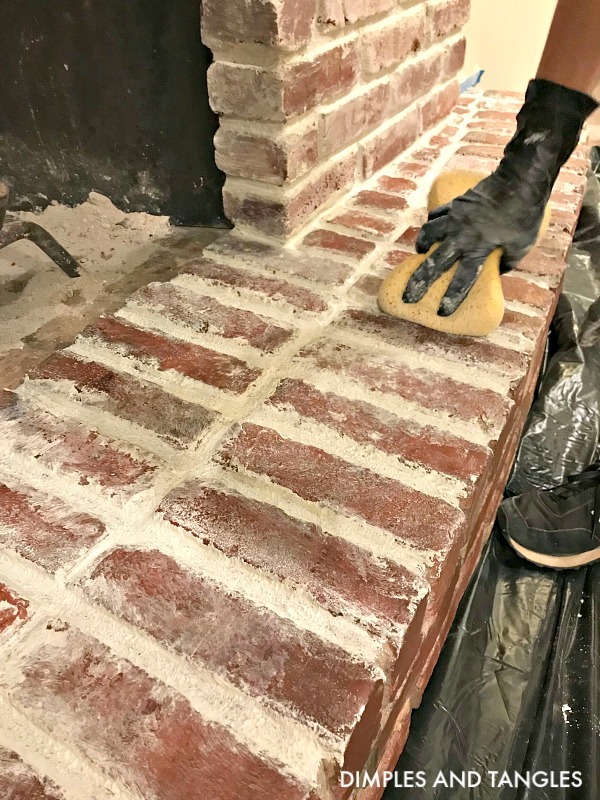 Her grout lines were deeper than the other fireplace so she ended up using this putty knife. She just put a dollop on the knife and applied the mortar to the grout lines, holding the knife perpendicular and working across the line. Once it was filled, she turned the knife so that it was aligned with the grout line and ran the knife down it. For her personally, once she figured this method out she was barely doing anything with the sponge at that point because the effect she was getting with the knife only was almost exactly what she wanted. She mainly used the sponge to apply a texture and just make sure it was all smooth. So if it's not apparent, you just need to experiment with your method a bit until you are happy with your result. Can you believe the difference?? I'd like to give a huge thank you to my sister for helping me with some of the details of this tutorial, and for sharing some of her photos! If this is a project you've been thinking about, I'd encourage you to try it! 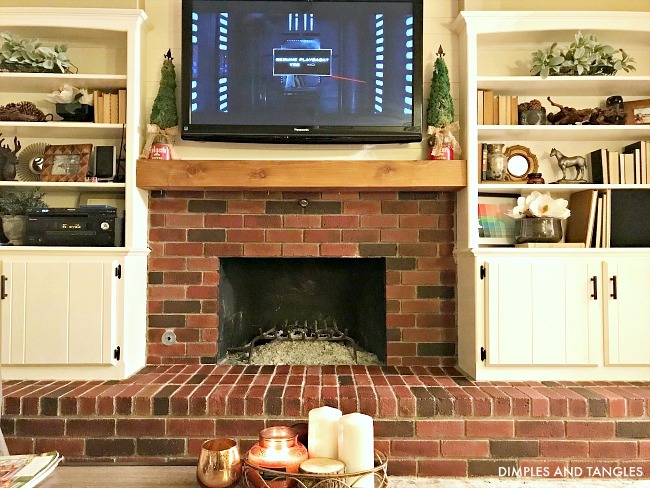 For just a few dollars in supplies, a few hours, and some elbow grease, you can totally transform the look of your space. 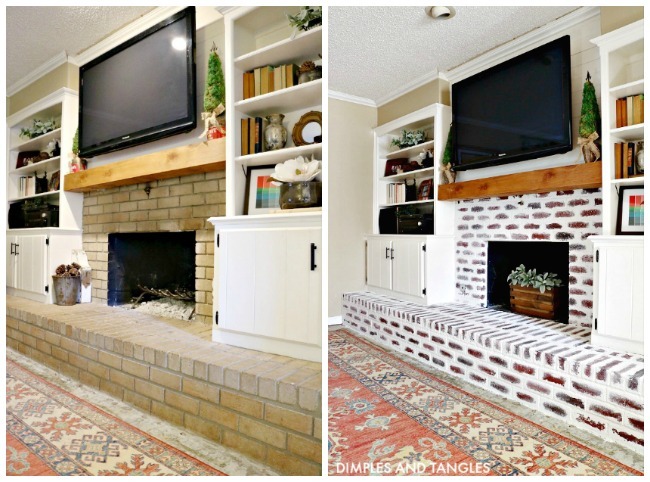 The styling on the updated fireplace really brings it to life as well. Thank you Kristen, it was fun to style it for Fall for her! WOW! They both look amazing! Great job!! This is so timely! 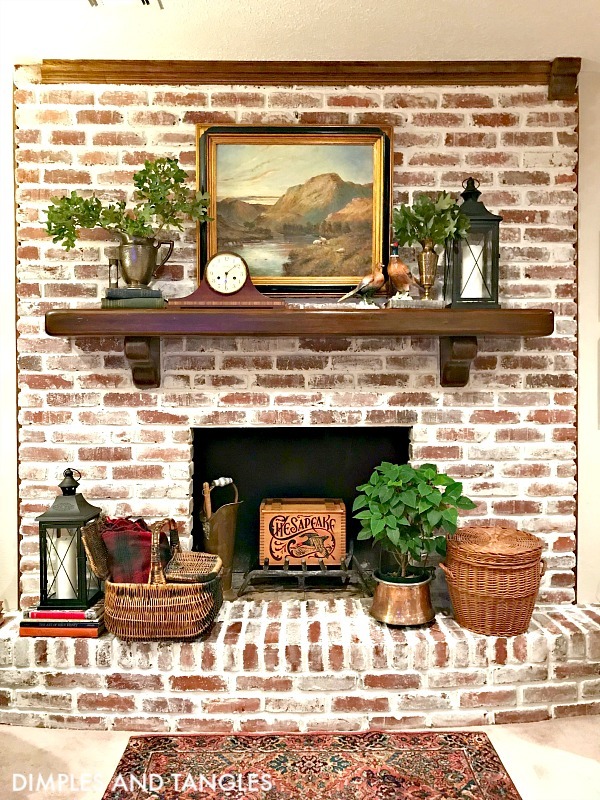 I have a wall of faux brick (UGH!) with red "bricks" widely spaced on black "mortar" with very deep spacing. Until I can afford to replace the walls (the other walls are dark barn board...ah, the 70s! ), I want to do something to lighten it up and make it look a tad more realistic. So thank you for providing the materials list and instructions! Now I just need a buddy! 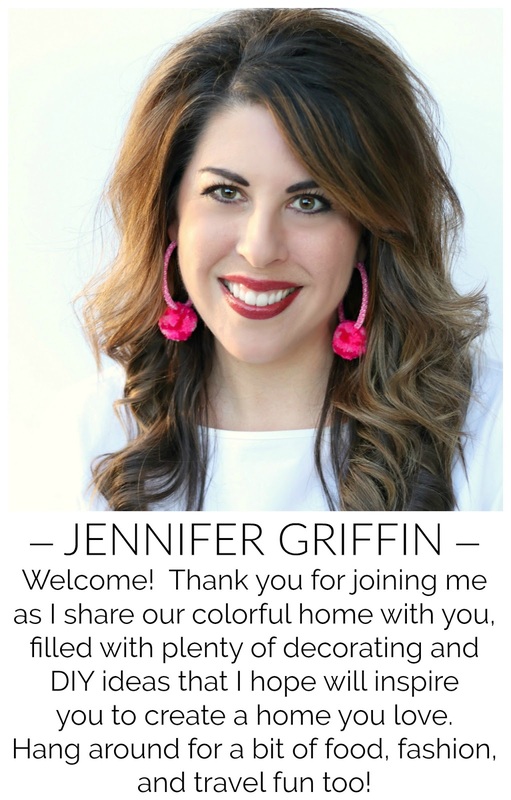 Colleen, I'm excited that this project might be a good solution for your problem wall! You can tackle it by yourself, it will just take a bit longer. Definitely more fun with a friend, though!